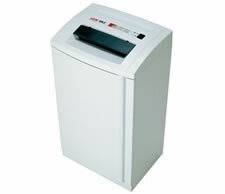 The HSM 225.2 (3.9mm) strip-cut shredders are designed specifically for use at the desk or as central devices for large offices. Ideally technically equipped, our HSM 225.2 (3.9mm) strip-cut model ensure a permanent high capacity. This machine not only shreds paper into small bits, but also CDs. Mobile, very high performance model for use as a shared device in large offices. Shreds store cards, credit cards with ease as well as CDs and floppy disks. Modern electronic controller. Photoelectric cell for automatic start/stop control. On/off switch with integrated reversing function. Folding safety element, in the security levels 2 and 3 with infeed slot for CDs and floppy disks. Stand-by mode with LED indicator. Stops automatically when the container is full and when the door is open. Automatic stop with LED plus auto-reverse in the event of a paper jam. Waste container with reusable collecting bag.